The aim of the project is the reduction of tensions and conflicts between Jews, Christians and Muslims in Mediterranean countries such as Egypt, Israel, Morocco and others. History: Increasing conflicts between Jews and Muslims arouse in Germany around the year 2000. After September 11th 2001 the situation has generally worsened and the Abrahamic Forum in Germany then developed the concept of „Abrahamic Teams“ – for the moment in Germany only. Jewish, Christian and Muslim personalities form such a team. Together they visit schools, education institutions and other events to talk about similarities and differences of their religions and to discuss it with the participants. These events are organized by the Abrahamic Forum in Germany. Members of the Abrahamic Forum are the Central Council of Jews, the Council of Christian Churches, the Central Council of Muslims, DITIB, the Spiritual Assembly of the Bahais in Germany as well as scientists and experts. Up until now, the Abrahamic Forum has conducted more than 500 events with Abrahamic Teams. The German Federal Ministry of the Interior, Building and Community sponsored most of these events for years. About 200 Jewish, Christian and Muslim personalities are working in the Abrahamic Teams. Evaluations and experiences have shown that conflicts between members of the Abrahamic religions have decreased and friendships between Jews, Christians and Muslims developed that have a positive impact on the society. 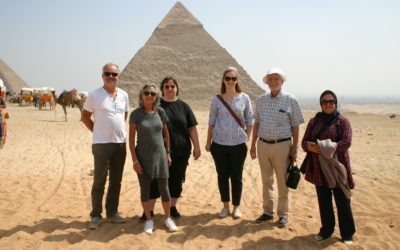 In 2014, the Protestant minister Prof. Dr. Tharwat Kadesh from Cairo contacted the Abrahamic Forum and asked if it is possible to set up events with Abrahamic Religious Teams in Egypt. Since he is well connected with religious institutions in Cairo such as the Coptic Church (up to the Patriarch), various Muslim institutions and governmental agencies and is familiar with the concept of Abrahamic Teams in Germany, he holds the necessary requirements to establish the project in Egypt. Today, the Abrahamic Forum can show first events with Abrahamic Teams in Egypt. Since 2016 the Abrahamic Forum held many meetings with Abrahamic Teams in schools in Egypt with the help of German Foundations. 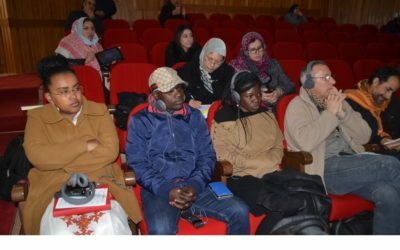 Since 2017 an Abrahamic Forum – Ibrahimic Forum Egypt – exists in Egypt where Jews, Christians, Muslims and Bahai work together. Also in 2014 Rabbi Ehud Bandel from Jerusalem got to know the project with Abrahamic Teams and asked to support this idea in Israel. Ehud Bandel is vice president of the International Council of Christians and Jews, and is well connected to Muslims and Christians in Israel. He started this project in 2016 which is now organized by Rabbi Nava Hefetz of the Rabbis for Human Rights in Israel with many events. In the meantime there was one event held in Morocco. The Abrahamic Forum is open to support other countries in establishing Abrahamic Teams as well. Target group: Participants are usually pupils and students aged 14 to 30 years of age. Also parents, teachers, religious communities, employees of the police or military and others in Israel, Egypt and other countries of the southern Mediterranean can join. The choice is mainly determined by those who are willing to invite an Abrahamic or Religious Team. Project Construction: Since 2016 the Abrahamic Forum finances about 10 events in Egypt and in Israel every year. There are also financial funds available to finance models in other countries. In Germany, the Abrahamic Forum contributes up to 500 euros per event for professional fees, travel expenses, preparation and rework. Consultations: In July 2017 an exchange on interreligious encounters was held in Bonn/Germany. From October 2nd to October 4th 2018 there will be an exchange in Cairo/Egypt. The summit of this exchange will be the opening of the International Academy for Dialogue in Cairo on October 4th 2018. Muslims, Christians and Jews will be prepared there to work together as Abrahamic Teams especially in schools. Interested people are welcome to join the exchange and the opening of the Academy. Sponsored by the Alliance Cultural Foundation, the Robert Bosch Foundation and Bread for the World. To view this site in German, please click here.